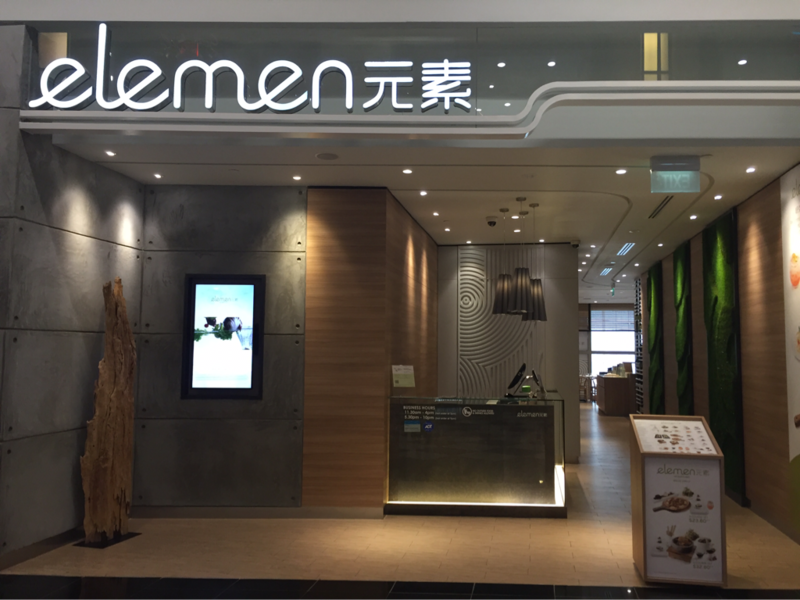 ELEMEN: Classy elegant vegetarian dining. 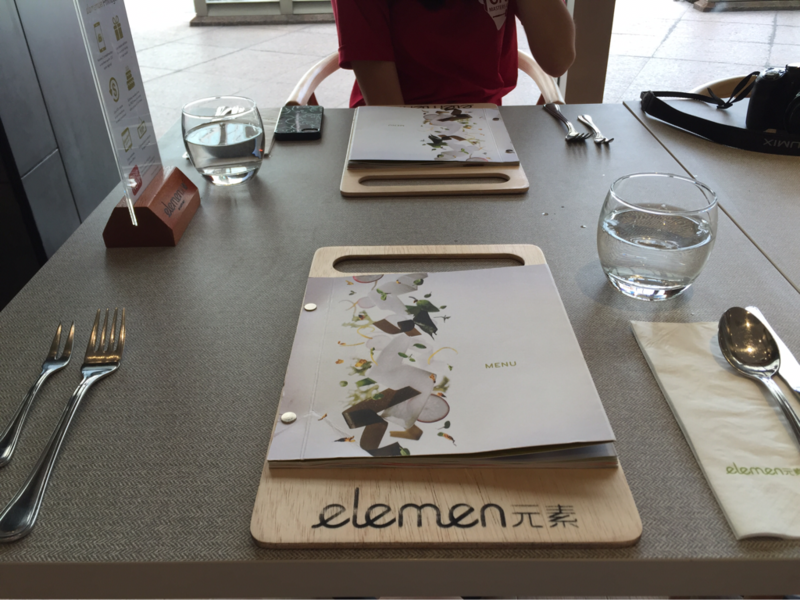 The last time my friend and I walked pass elemen, we vowed that we would come back to try it. 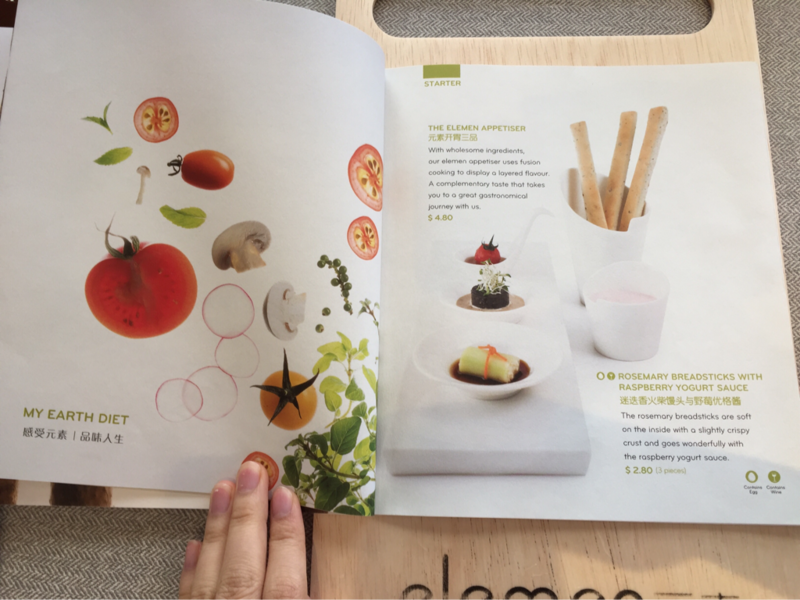 Furthermore, a few months back when elemen had just opened, I saw Instagram posts about media-tastings and was dying to try out. Now that I got to try it, I was really happy about it. 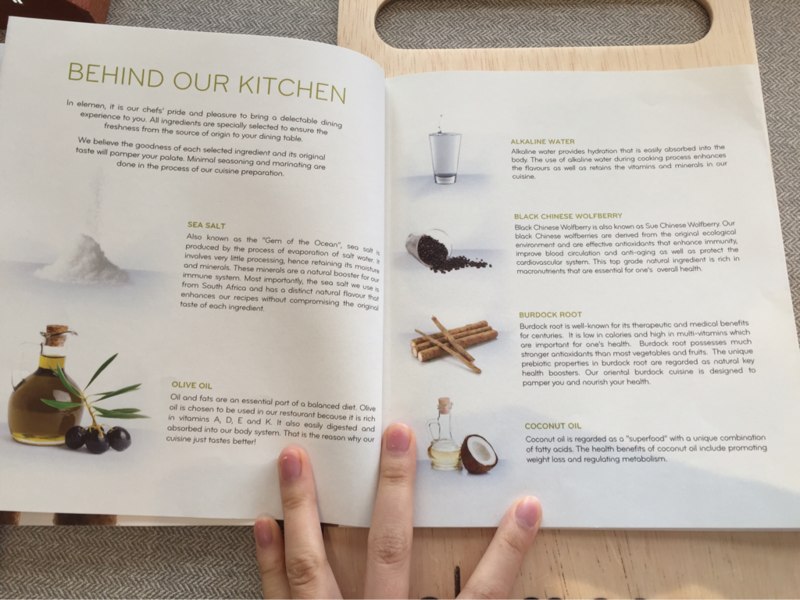 "Whether you are inclined towards a vegetarian lifestyle, love natural food or share a healthy concern for both the Earth and your personal well-being, we welcome you to elemen. 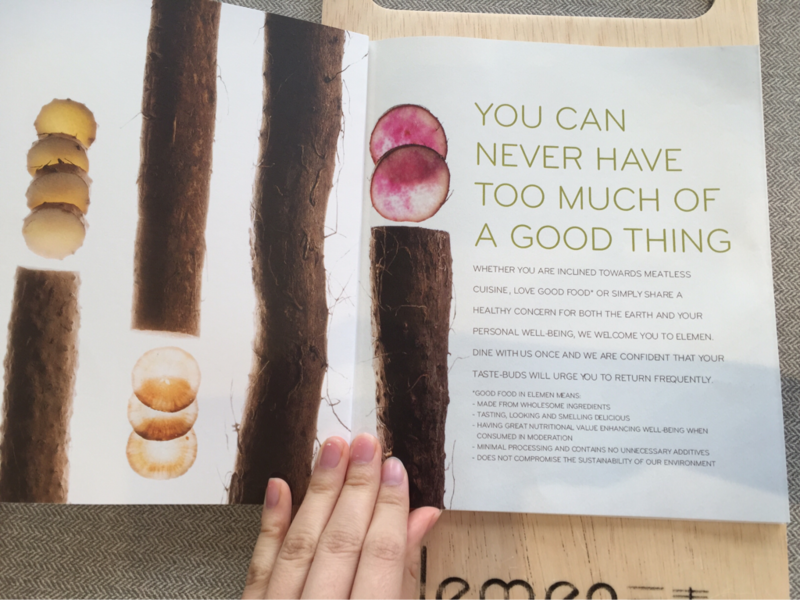 elemen offers a pleasant dining experience by serving wholesome food that is beneficial to your health without compromising the earth’s sustainability. From the outside, elemen gives off a really classy and down-to-earth look. I really love the wooden walls they used and the fake grass panels, it really gives a nice earthy look to the restaurant. 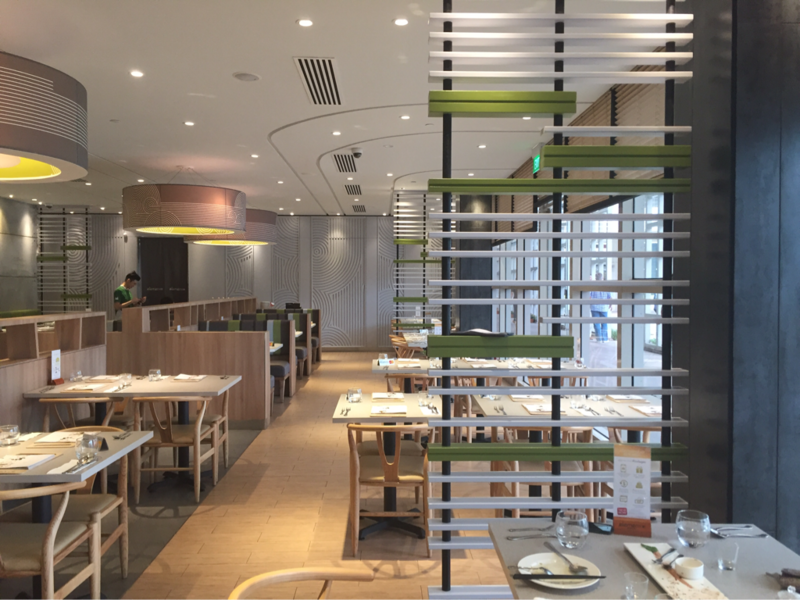 The interior of the restaurant was nice and spacious, with plenty of tables to accommodate 108 customers (according to their site). 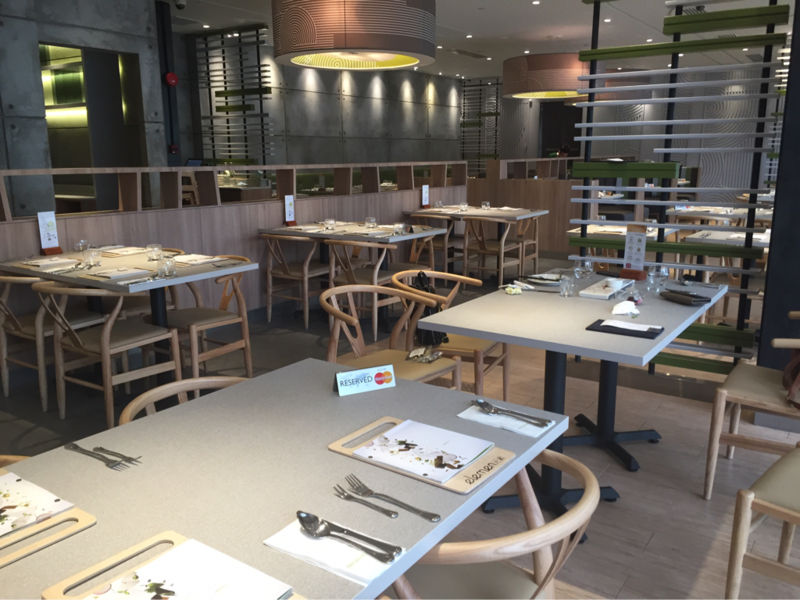 I love the green-brown-white-grey theme of the restaurant - it's a really unique colour combination and gives customers the feeling that they are in a forest. 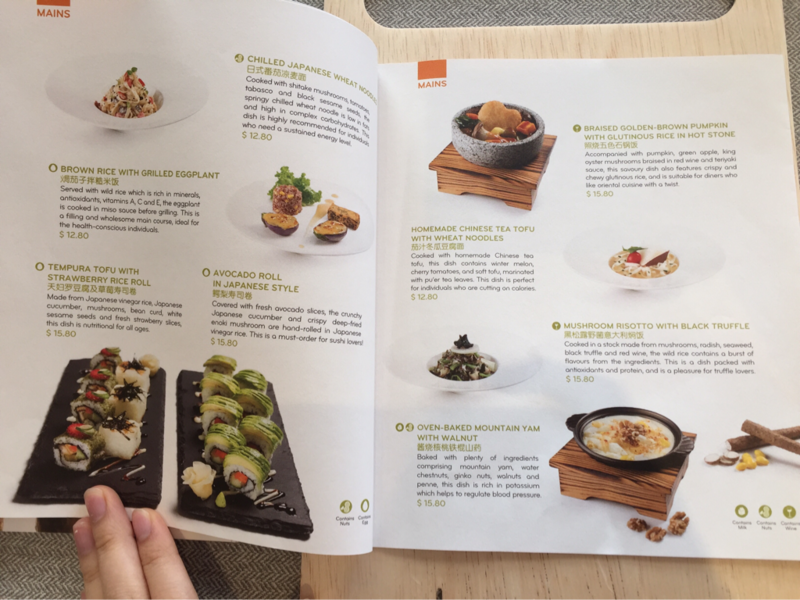 Since we wanted to try an array of dishes, we decided to order one 9-course set with an extra main to share between the two of us. By the time we had finished all the food, we were stuffed to the brim. 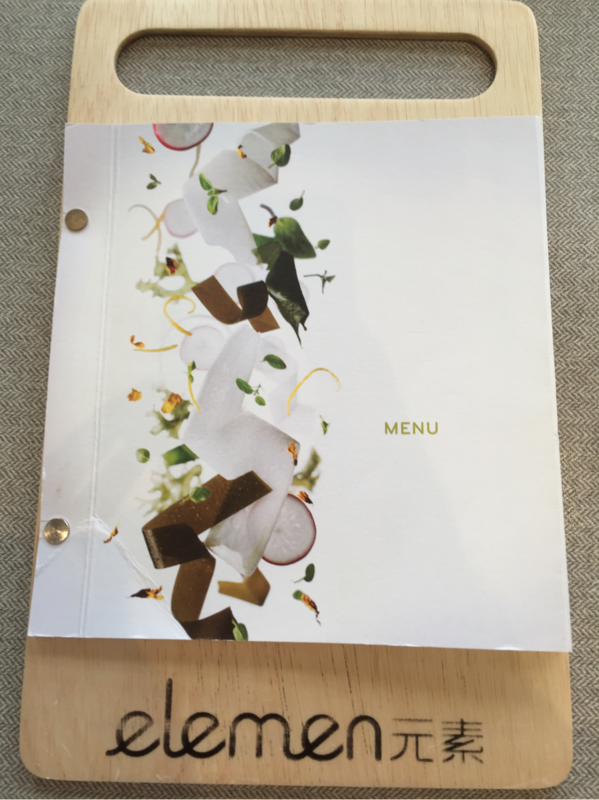 I think that if we had ordered one 8-course set each, we would have exploded. 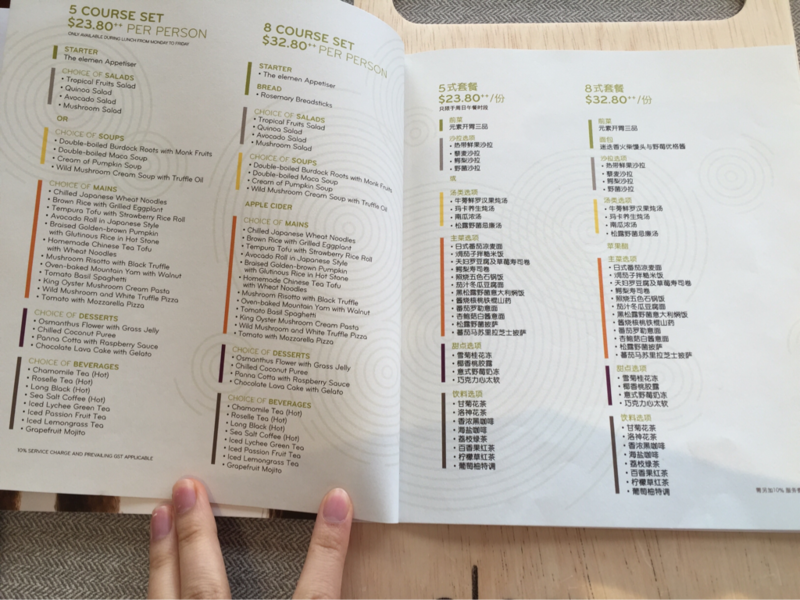 ***We ordered the course set but the prices listed below are all when ordered as ala carte. The elemen appetiser comes in three small compartments and is supposed to be eaten in the order from front to back as shown in the photo above. 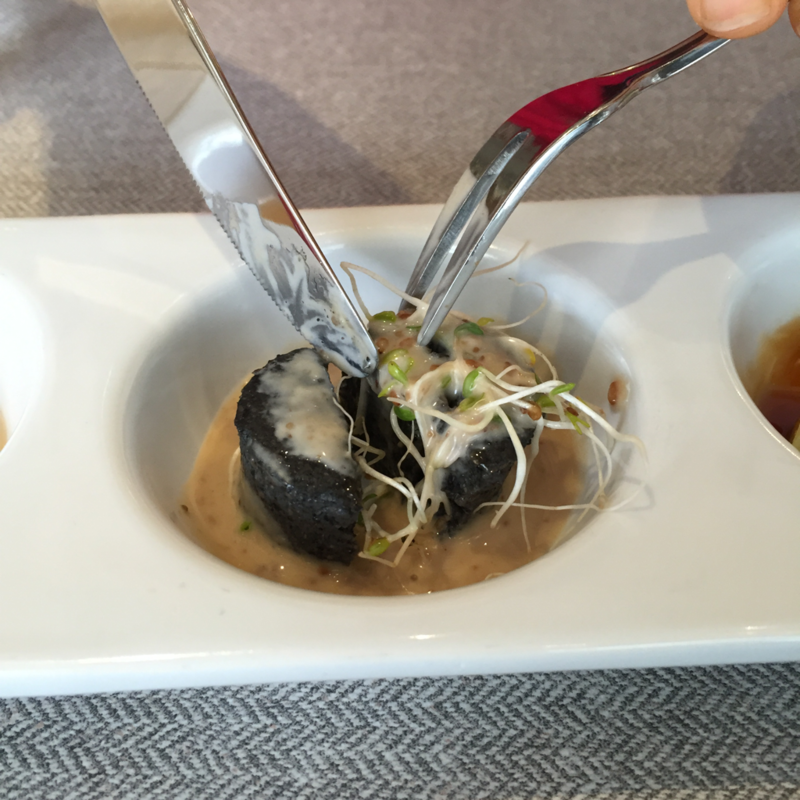 When I first saw this appetiser, I didn't think much of it but upon tasting it, I was totally impressed. 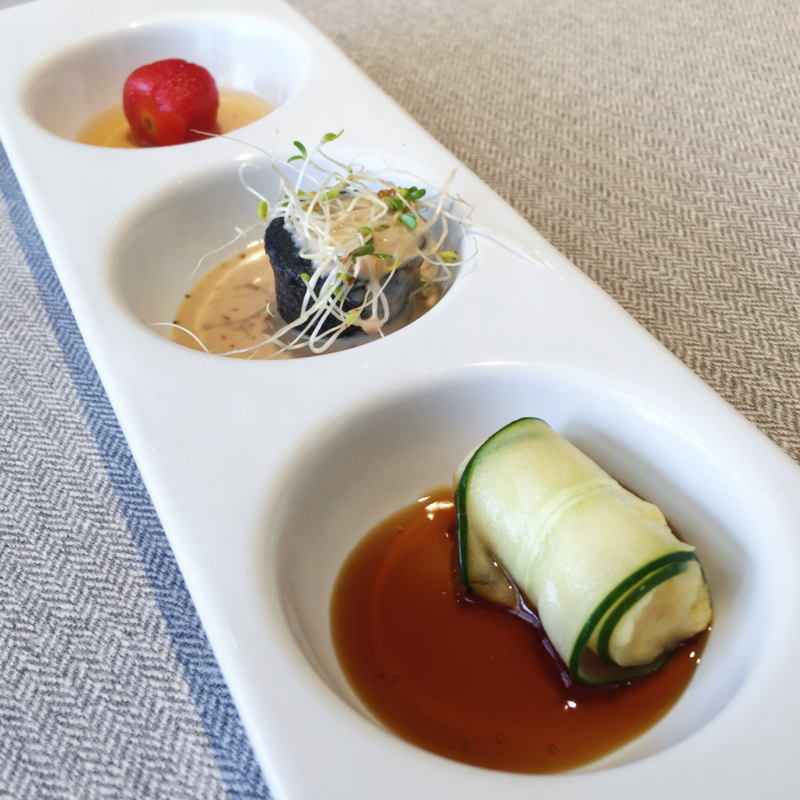 Each part of the appetiser had its own unique delicious taste and all of the components of the dish came together really well to whet my appetite. ***I can't exactly remember the exact components of each part of the dish but the following is what I remember. 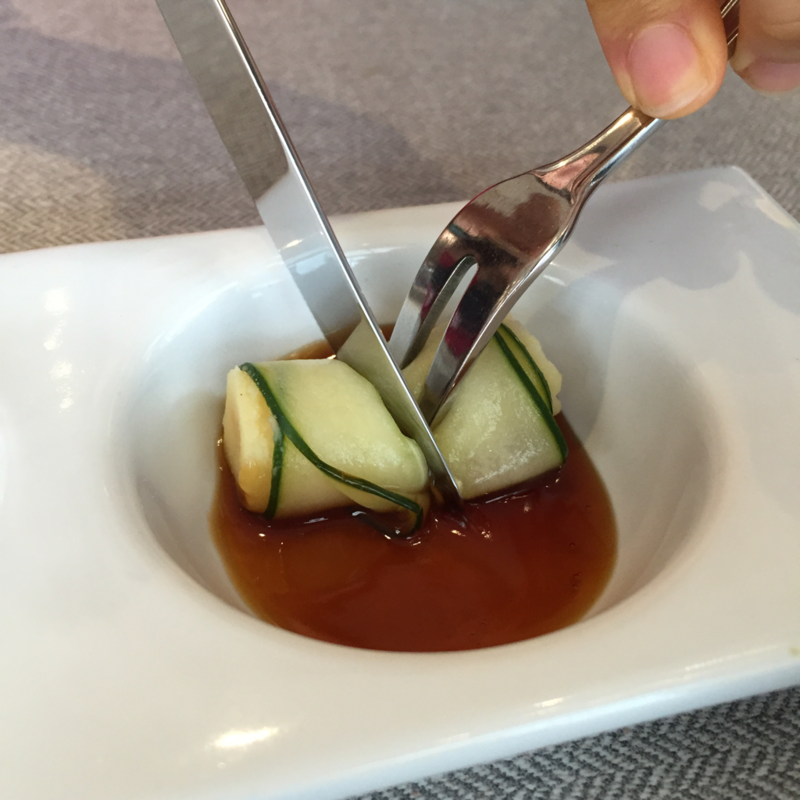 This is green bean paste wrapped in cucumber in teriyaki sauce - the first part of the appetiser. I loved this part of the appetiser so much! 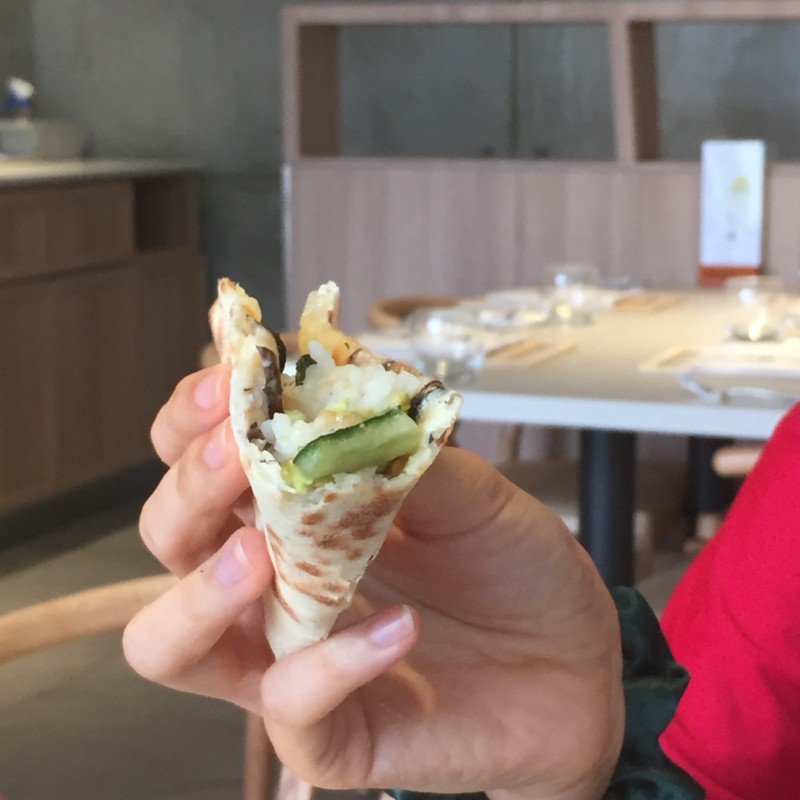 The cucumber was sliced so thin such that it was soft and tender, filled with a green bean paste that wasn't too sweet. When paired with the sweet salty teriyaki sauce, it was so delicious. Never did I think that a dish made up of only three ingredients could taste so good. This is black sesame tofu topped with alfalfa sprouts in sesame dressing - the second part of the appetiser. This part was probably my favourite part of the appetiser. The firm but silky and smooth black sesame tofu went really well with the slightly tangy sweet sesame dressing, and the alfalfa sprouts added a nice crunch to the dish. 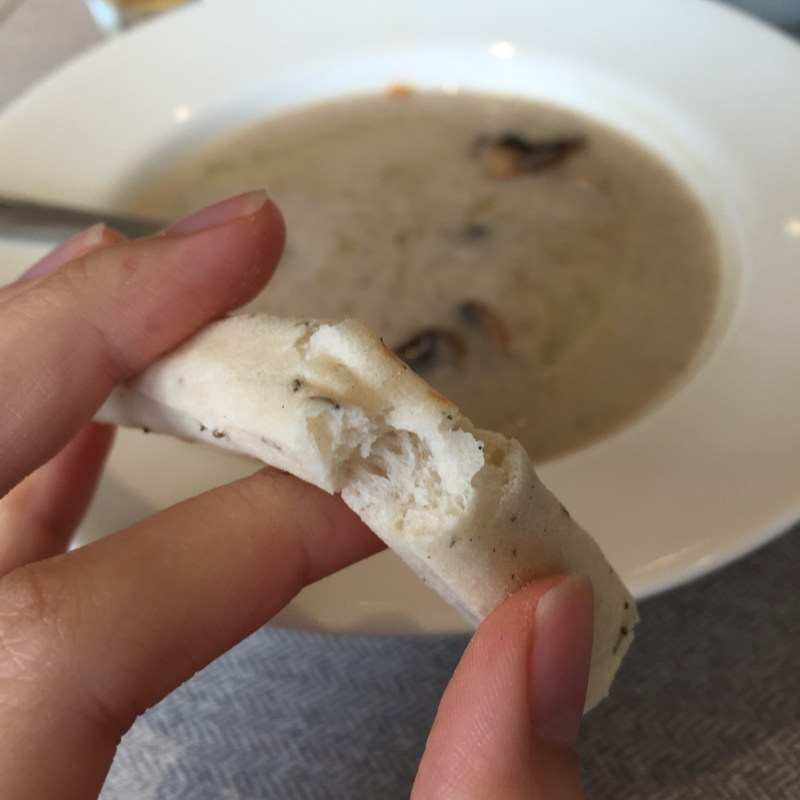 This part of the appetiser was also made up of only three ingredients but so so good. 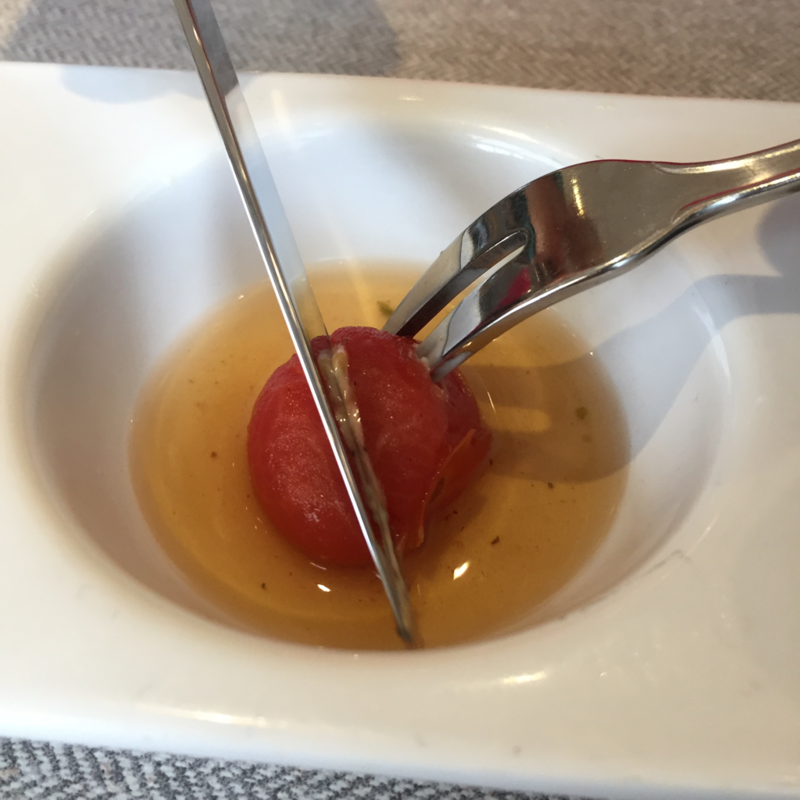 This is peeled cherry tomato in some sort of sesame vinegar cider dressing (kind of forgot) - the third part of the appetiser. This part was my least favourite of the three, but was still really tasty, even though it was slightly too sour for me. 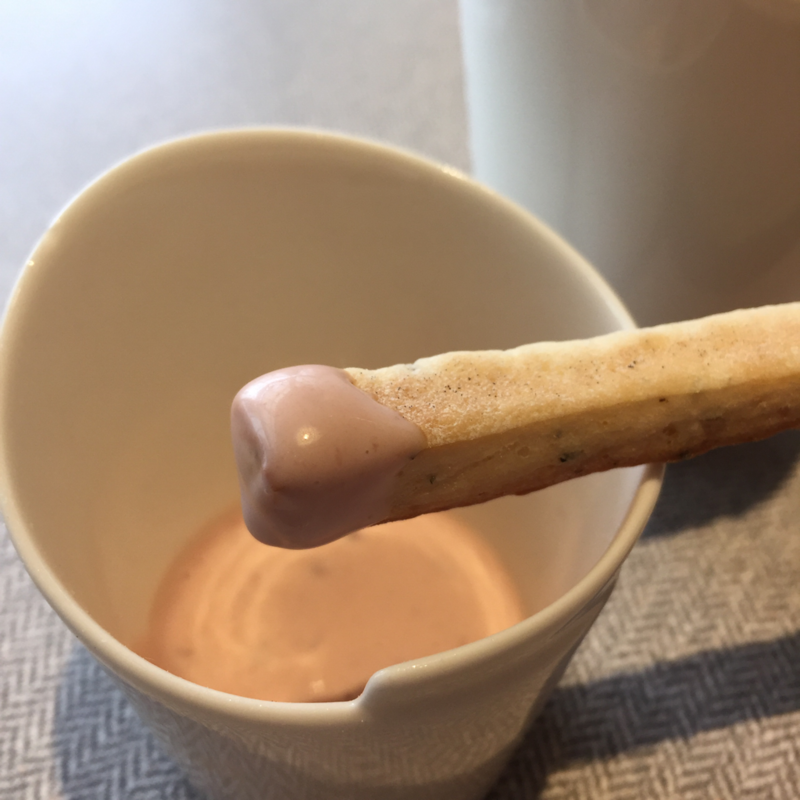 There were three pieces of breadsticks which came with a sweet raspberry yogurt sauce. The breadsticks themselves were nice and fluffy and the fragrance of rosemary made it taste like focaccia bread. 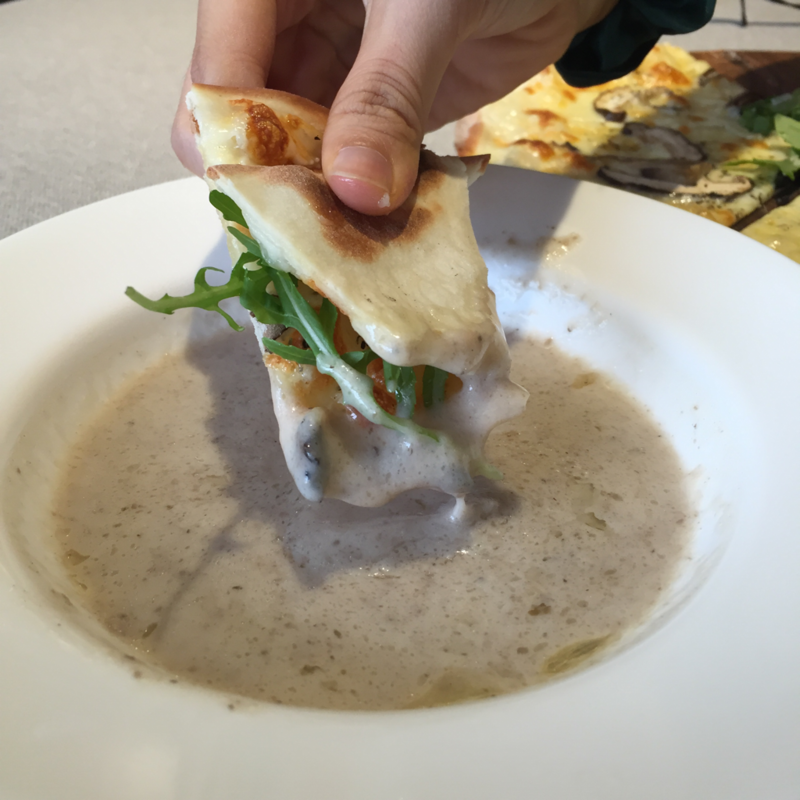 It tasted really good when dipped in the mushroom soup. The raspberry yogurt sauce was creamy and sweet, with a nice tanginess. However, I feel that the fragrance of rosemary is masked when the breadsticks are dipped in the raspberry yogurt. This dish is an assortment of mushrooms topped in a light soy sauce dressing with a side of lettuce. 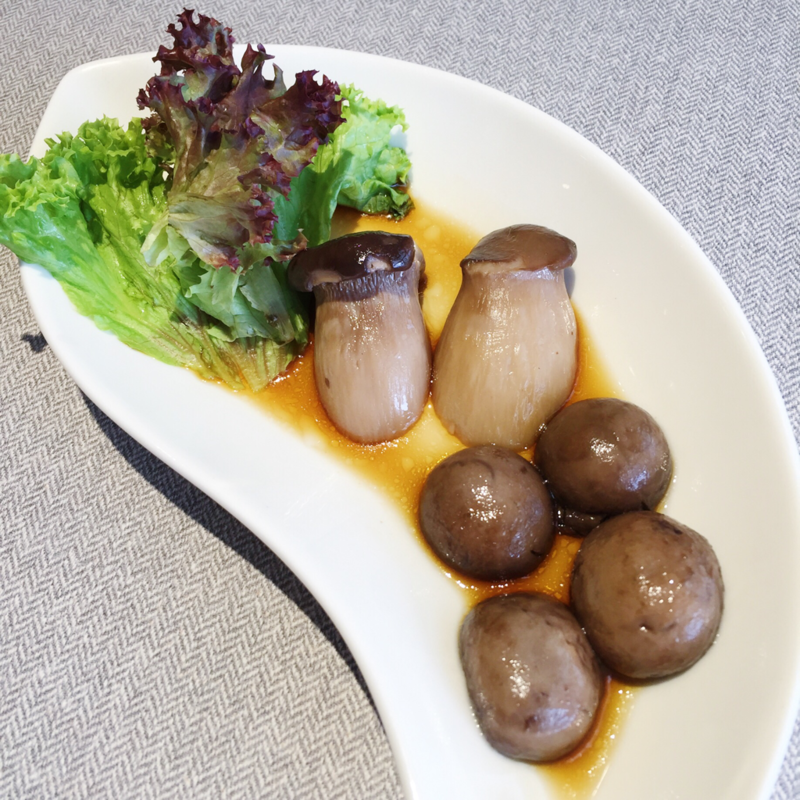 The mushrooms are cooked to perfect tenderness and go really well with the light soy sauce. Quite a simple dish, but definitely a mushroom-lover's paradise. 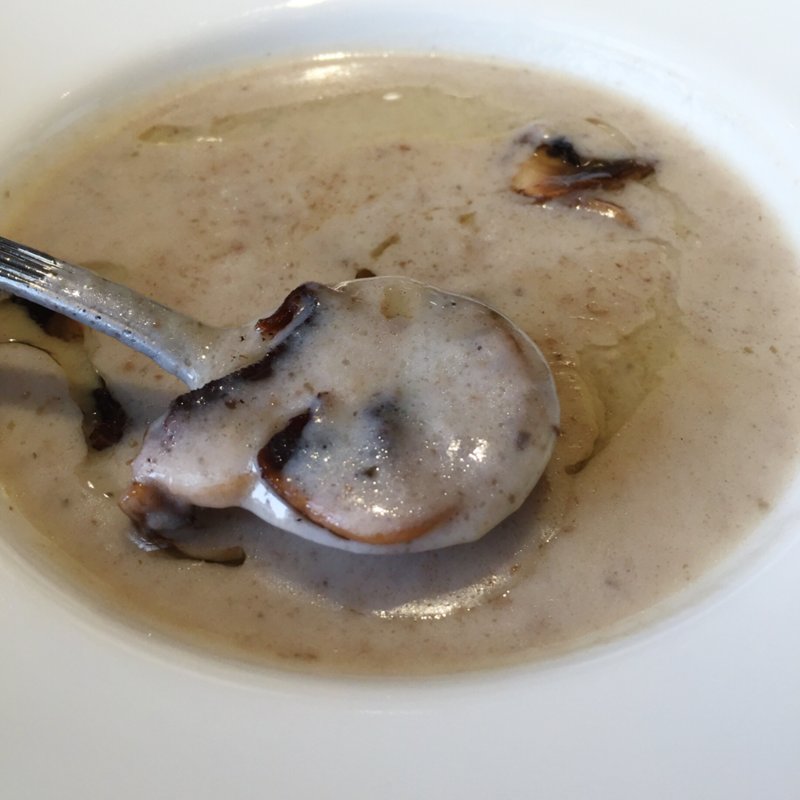 This mushroom soup was smooth and creamy, with large chunks of mushrooms inside. 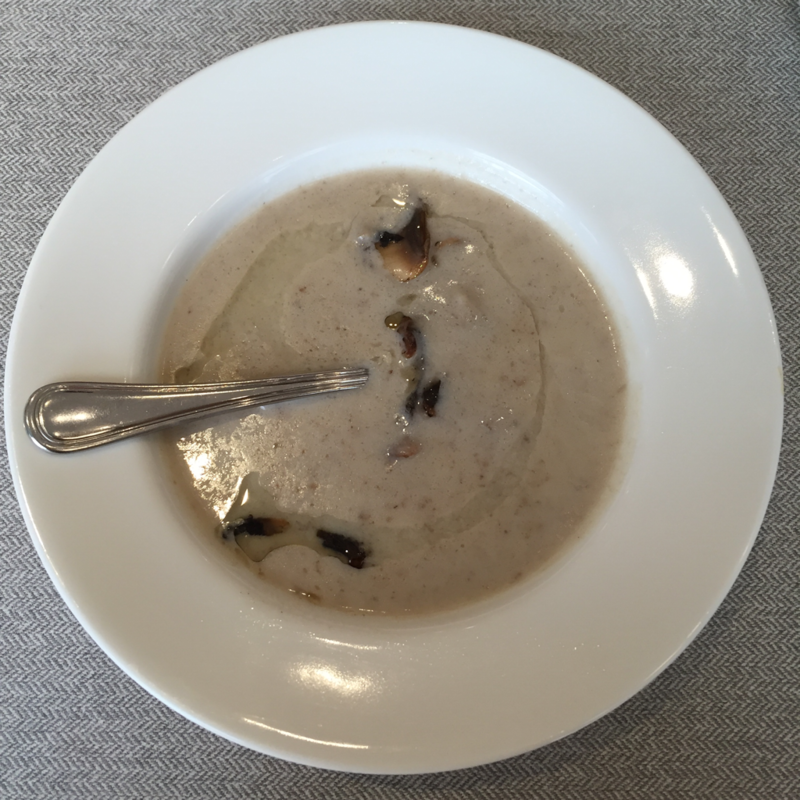 I am not that much of a truffle fan but when this mushroom soup is drizzled with truffle oil, it tasted ten times silkier. I love how they are so generous with the truffle oil and the smell of truffle could be smelt immediately when the soup was placed on our table. 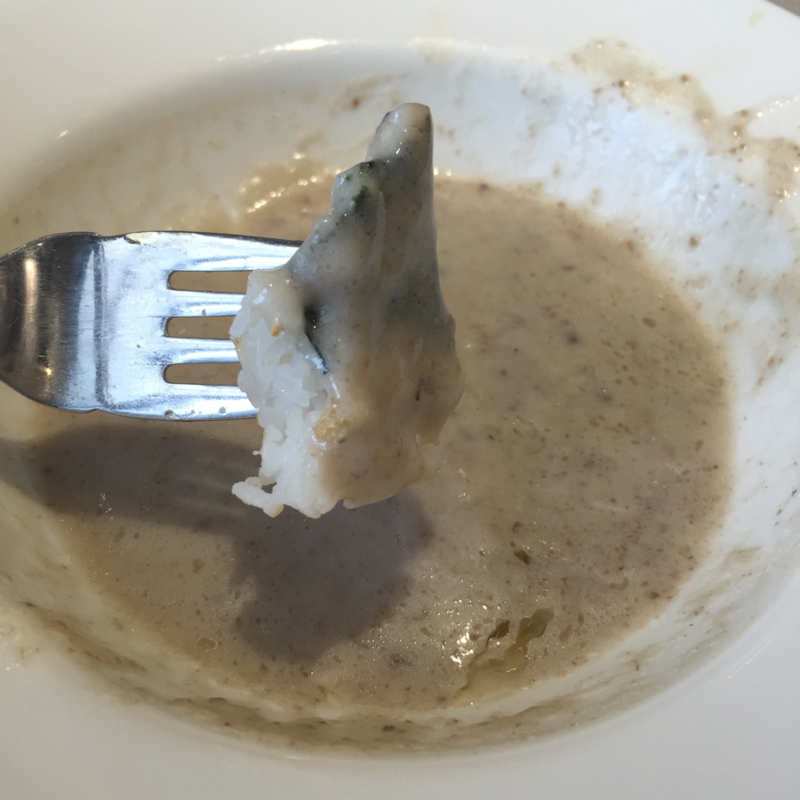 I also like that the soup wasn't too salty such that I could still taste the original taste of the mushroom. Look at those chunks! We kept exclaiming how good this soup was that we dipped almost everything in this. ... to pizza. It may look and sound weird but it tasted AMAZING. 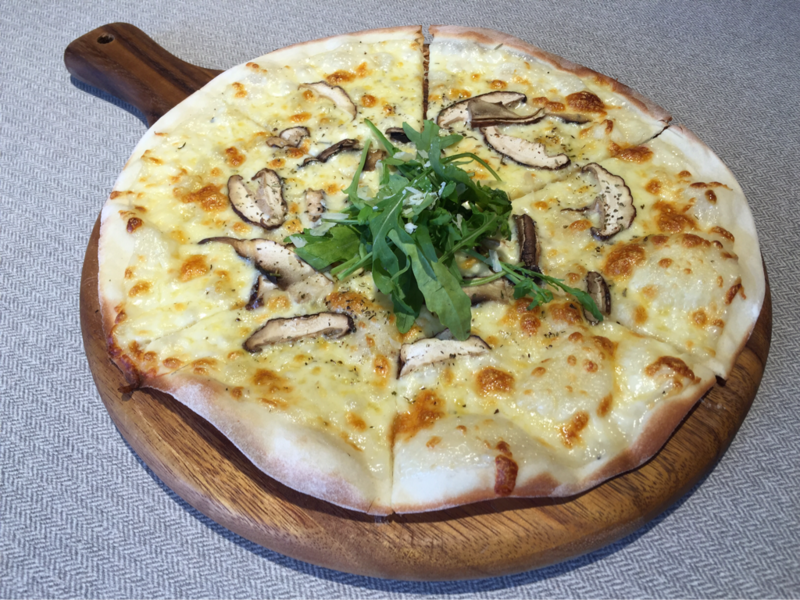 Especially the truffle mushroom pizza topped with the mushrooms from the mushroom salad dipped in the truffle mushroom soup - YUM. Mushroom heaven for mushroom-lovers. This apple cider vinegar tasted too sour for me on my first sip (you should have seen my reaction when I first tasted it) but after a while, I got used to its taste and grew fond of it, gulping it down in one shot. 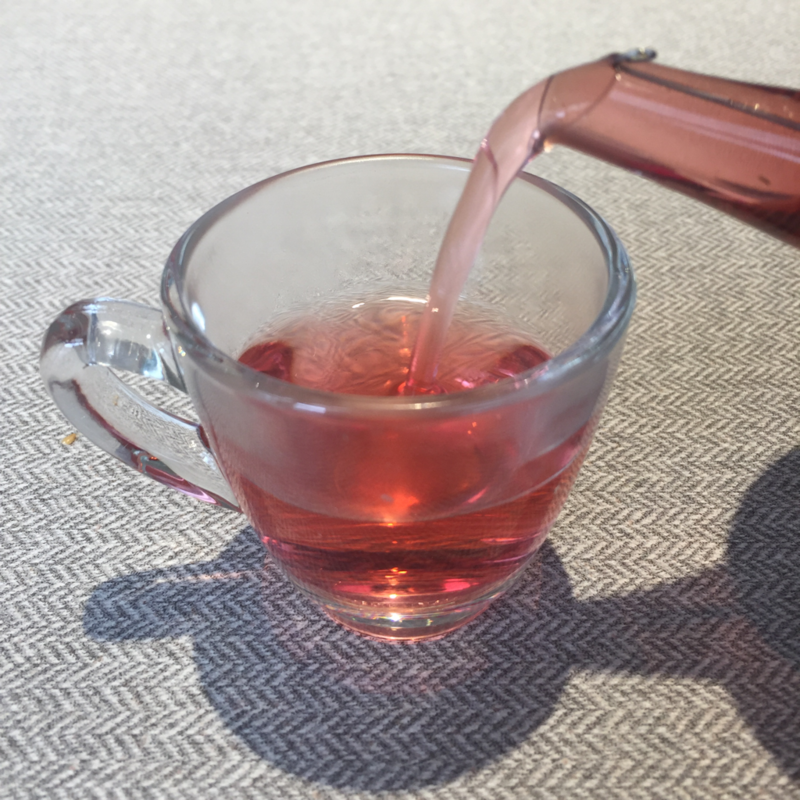 I think its tanginess makes it a great palate cleanser after all the appetisers before starting on the main course. 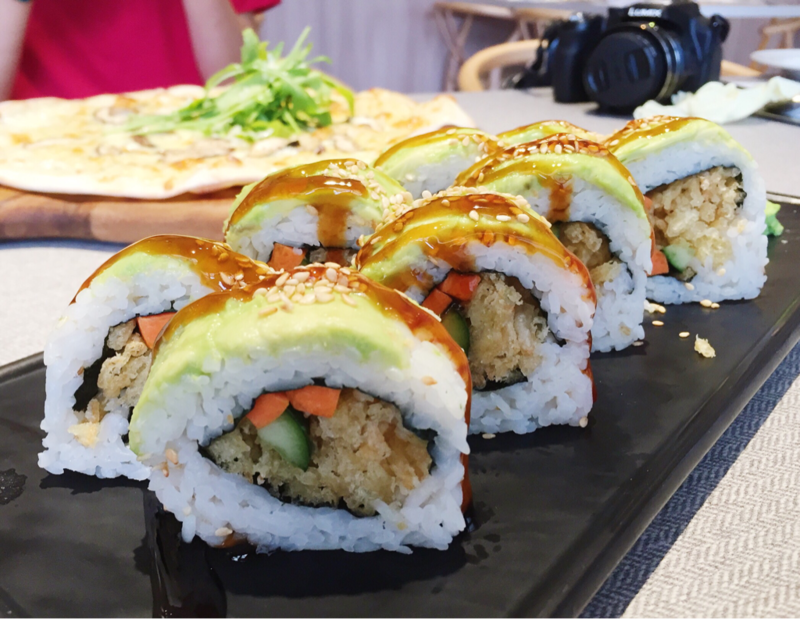 The avocado roll is made up of carrots, cucumber and tempura enoki mushroom rolled in Japanese sushi rice, topped with avocado, teriyaki sauce and sesame seeds, served with a side of wasabi and pickled ginger. Maybe because we spent too long taking the photos, by the time we ate the sushi, the tempura enoki mushrooms were soggy and cold. 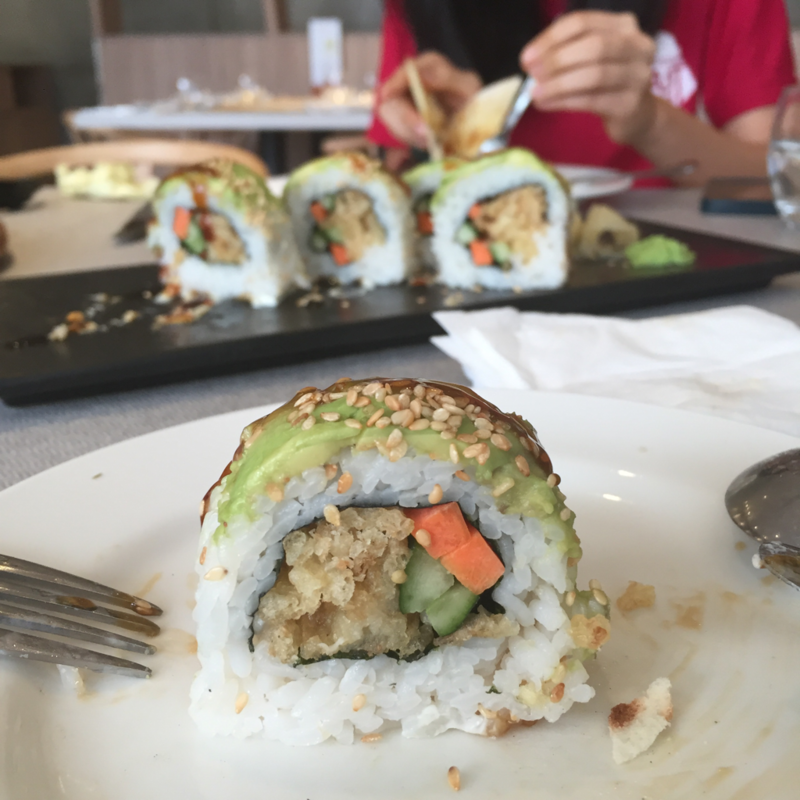 Other than this, this sushi roll was close to perfect. 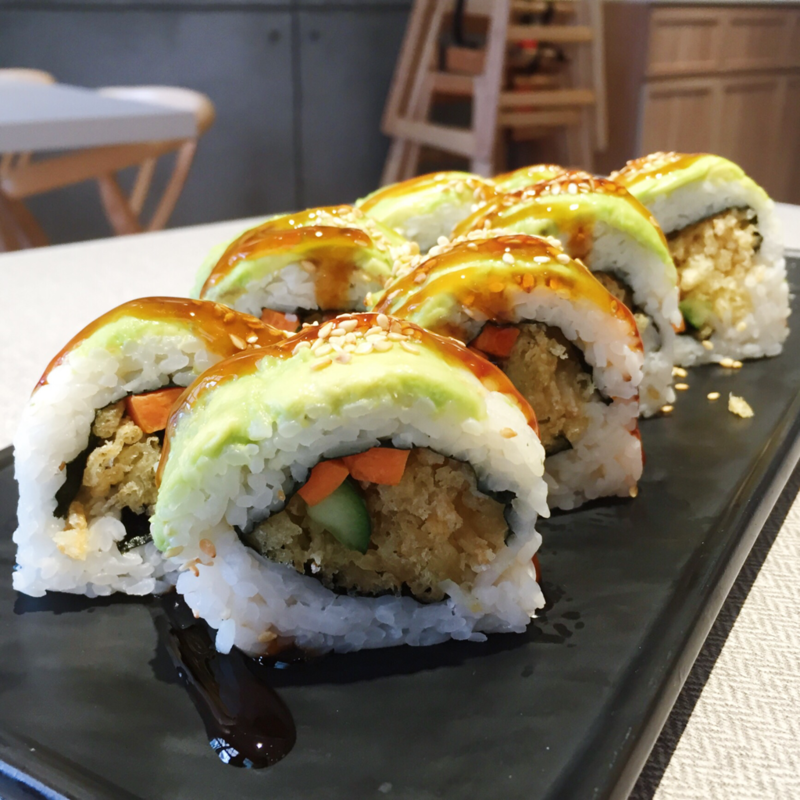 The sushi rice was seasoned perfectly, the avocado was nice and creamy, while the carrots and cucumber added a nice crunch. 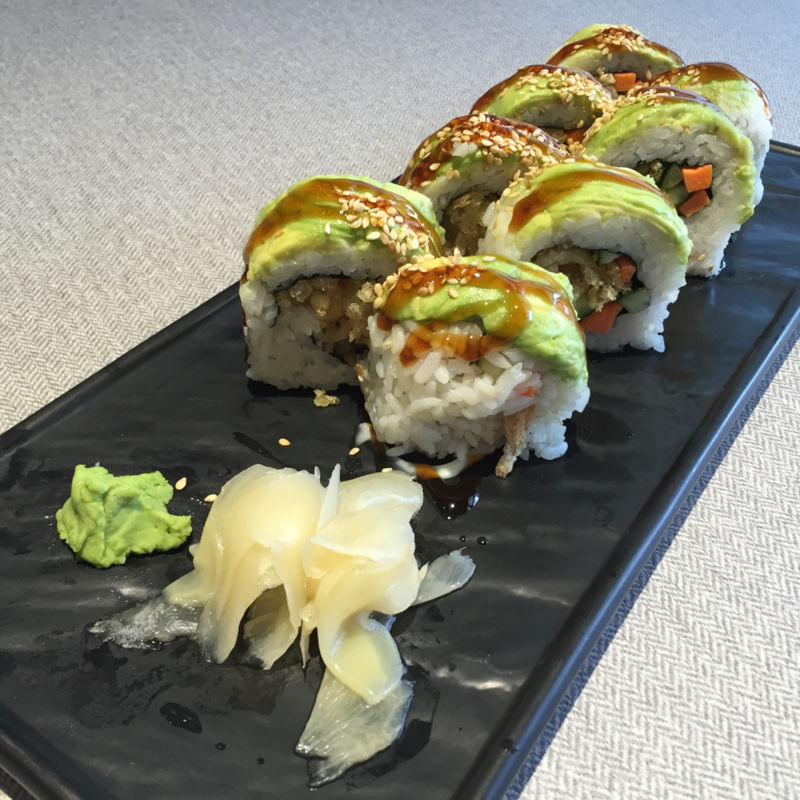 The teriyaki sauce added a nice salty sweet flavour to the sushi. Afterall, what doesn't taste good with teriyaki sauce? 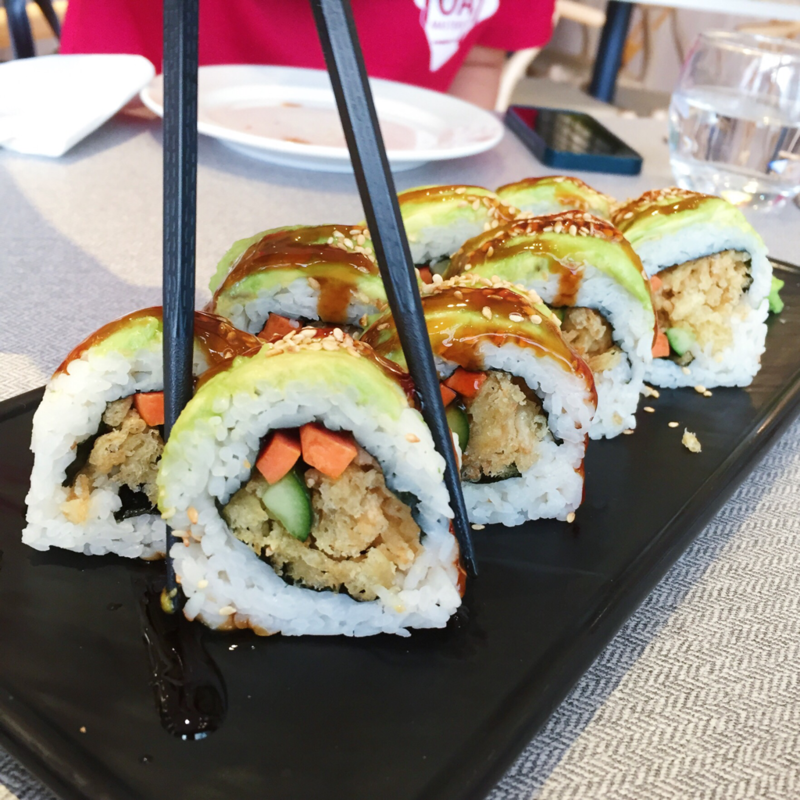 The sushi rice was also of the perfect sticky texture and rolled very tightly such that you can bite on the sushi (for those with small mouths like me) without it falling apart! Definitely a must-try when you come here! Definitely one of my favourite dishes of the day, especially when eaten with the pickled ginger! This pizza was highly recommended by my friend as she had dined here previously and thoroughly enjoyed this one. Just like she predicted, I thoroughly enjoyed this pizza. 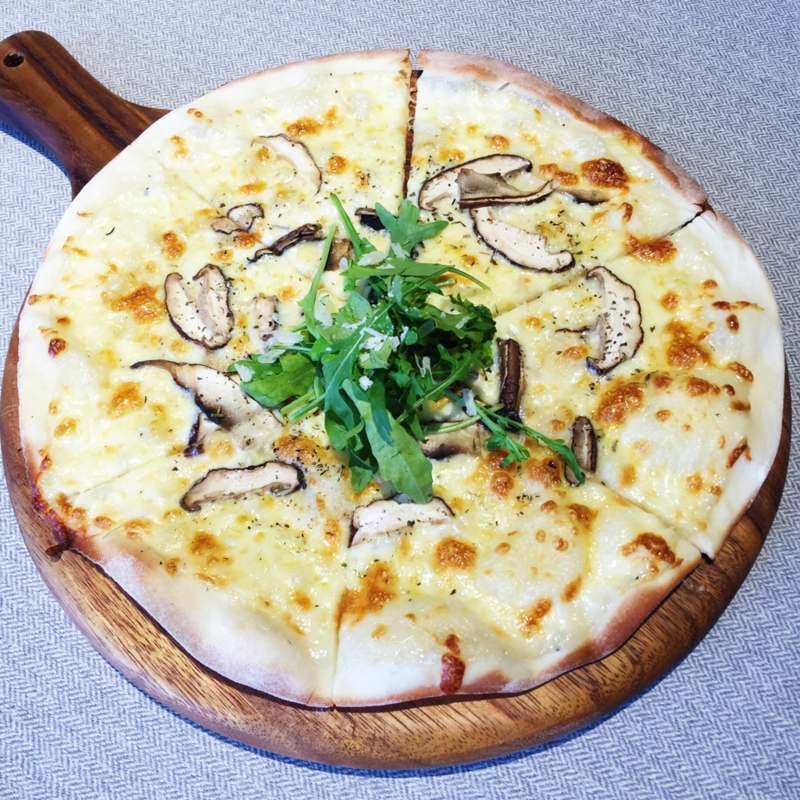 The crust was thin but crispy, the sauteed mushrooms were tender and juicy, the cheese was greasy and gooey, and the white truffle oil added a nice extra hint of mushroom to the already mushroom-laden dish. The only thing I didn't like was the arugula leaves because I personally dislike arugula - a lot. 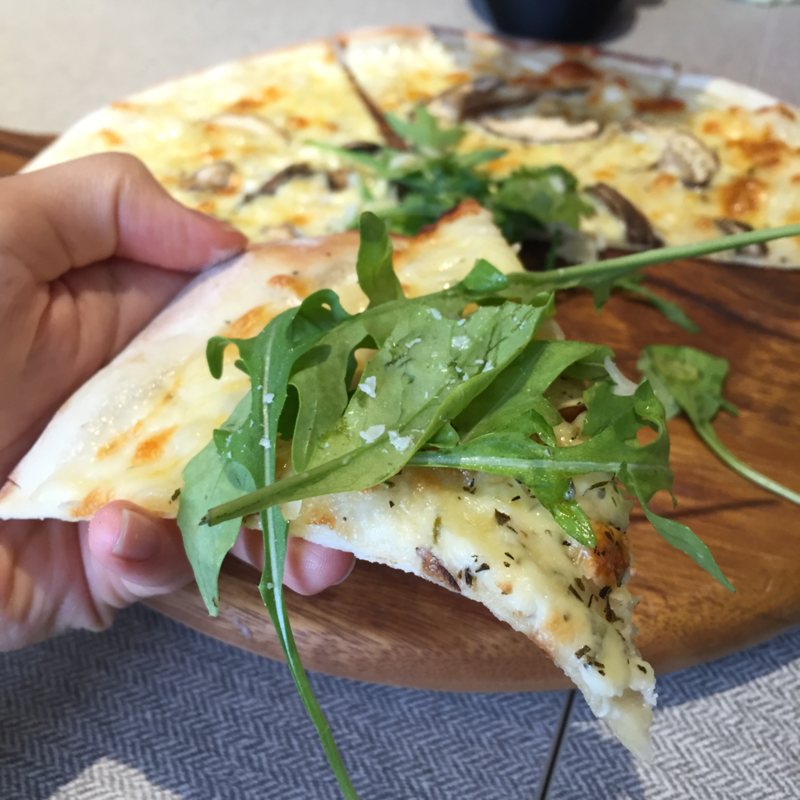 But I guess for those people who are alright with arugula, they probably will enjoy the combination of the bitter arugula with the savoury pizza. However, if you leave the pizza for too long while eating other food, the cheese kind of dries up and gets cold, and isn't as nice as before. 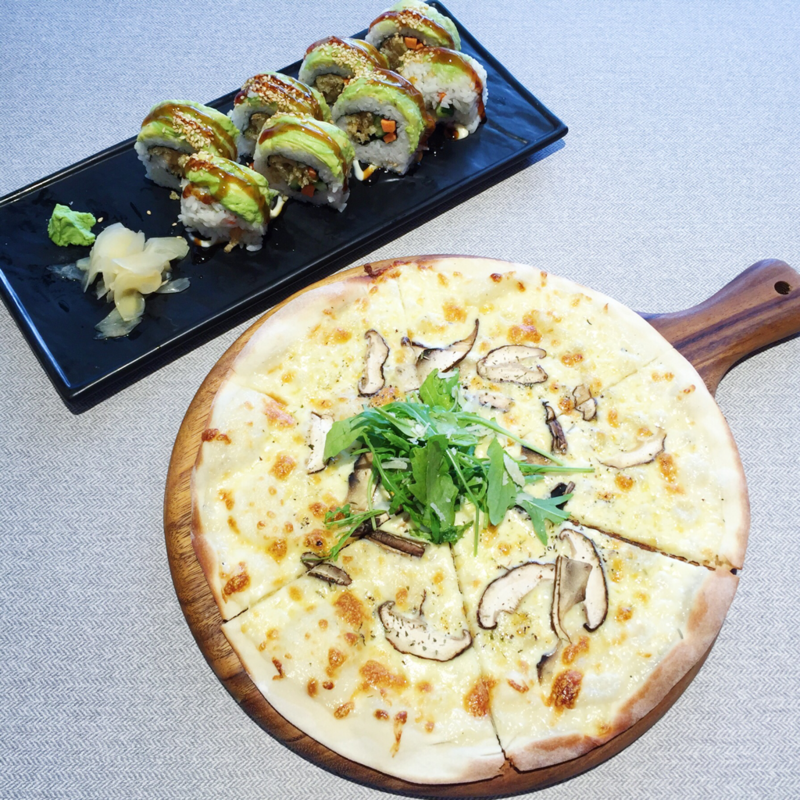 Therefore, I definitely recommend you to finish this pizza as soon as possible before eating the rest of the food. ... as well as when eaten together, featuring my crazy friend and her weird concoctions. This chocolate lava cake was served the last, with a small scoop of vanilla gelato and sprig of mint on a long rectangular plate. When I first cut open the lava cake, there was no lava flowing out. 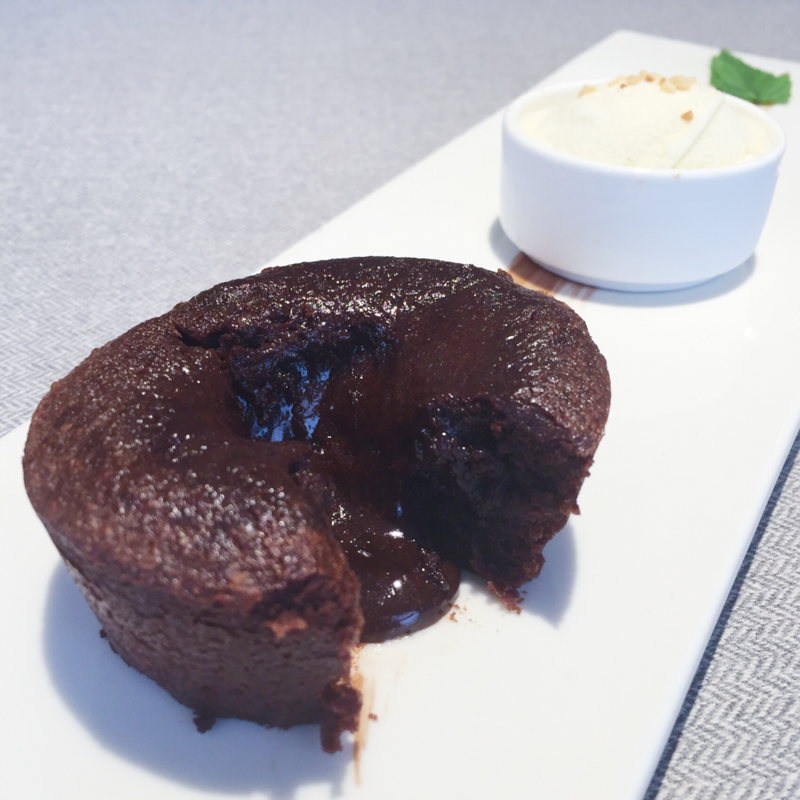 However, after a while the chocolate lava began to flow out because the chocolate lava was so thick and viscous! You wouldn't be able to imagine how rich and thick the chocolate centre was! Furthermore, my friend isn't a fan of it so I had it all for myself - I WAS IN CHOCOLATE HEAVEN. The chocolate cake itself was moist and cakey and easy to cut through. 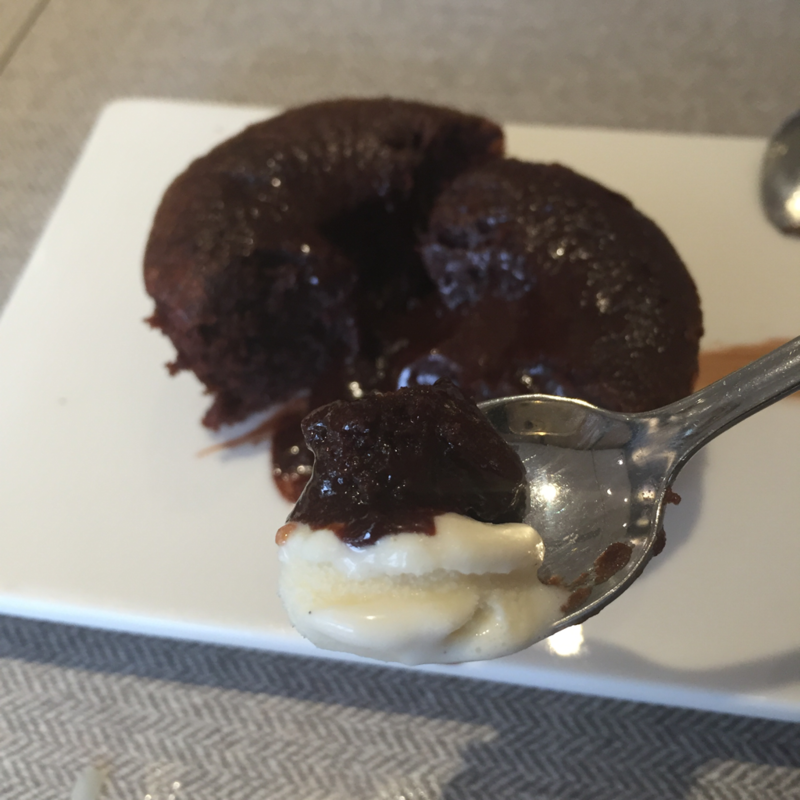 It also wasn't too sweet and went well with the sweet molten chocolate lava centre. 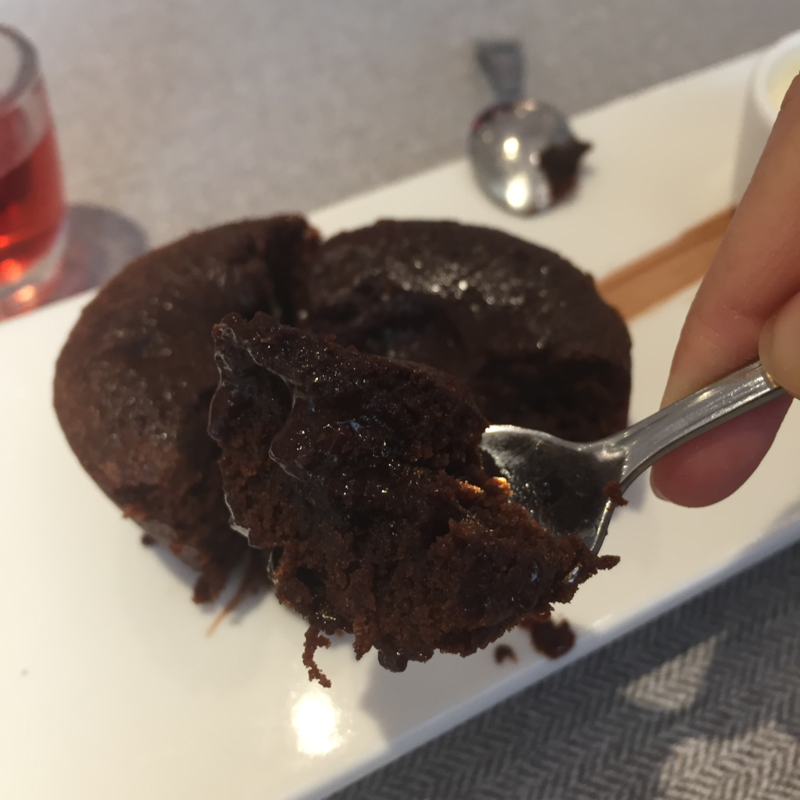 Definitely one of the best chocolate lava cakes I've ever tried. 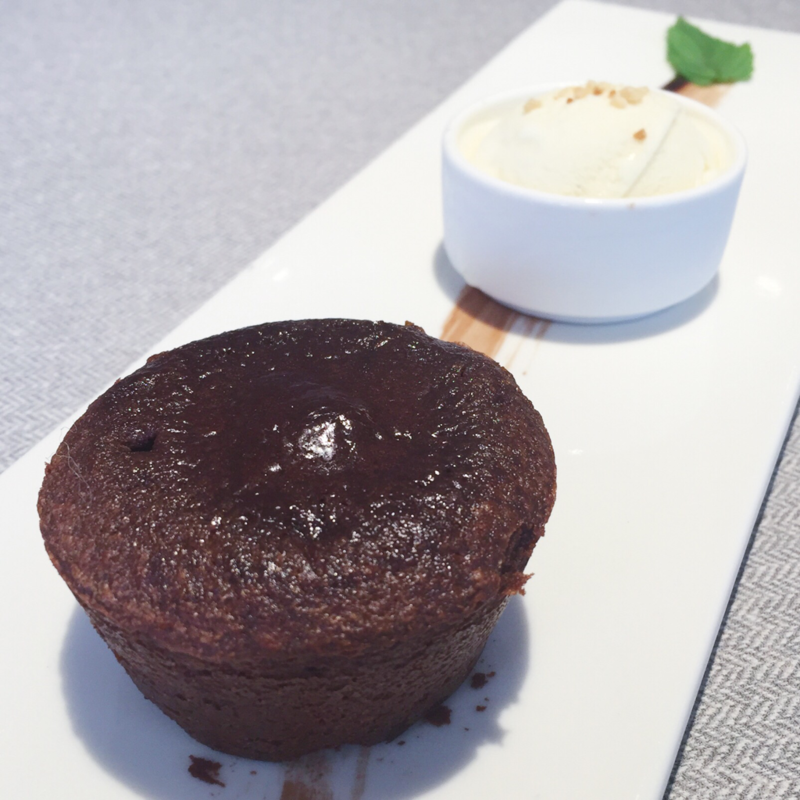 The cold vanilla gelato went well with the warm chocolate lava cake. The vanilla gelato itself tasted normal to me, nothing special. I feel that premium vanilla gelato with specks of vanilla beans giving a stronger vanilla taste should be used instead to better complement such a high-class dessert. 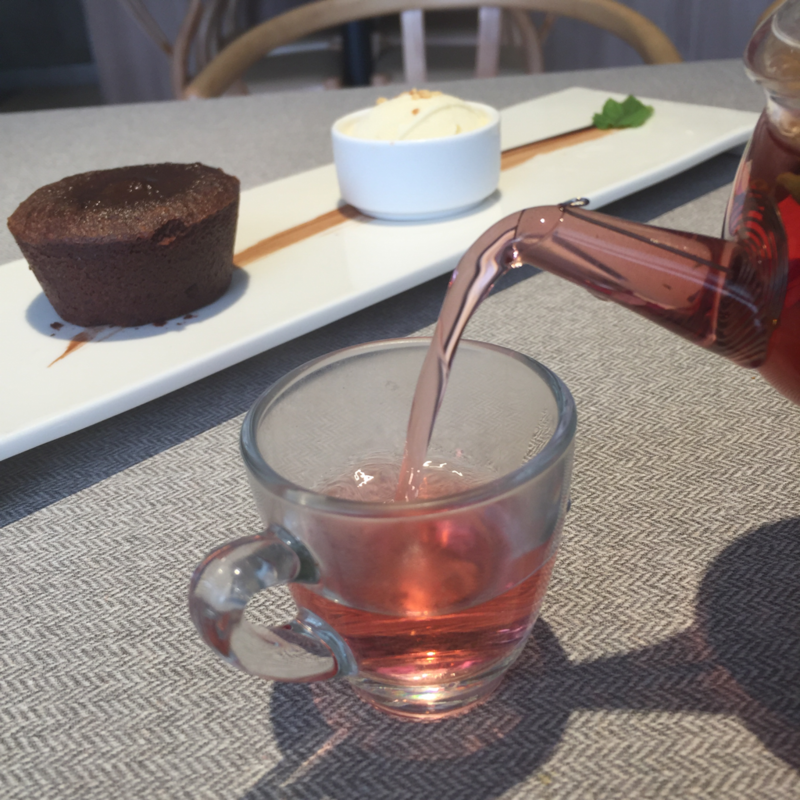 My friend chose this roselle tea because she had tried it before previously. 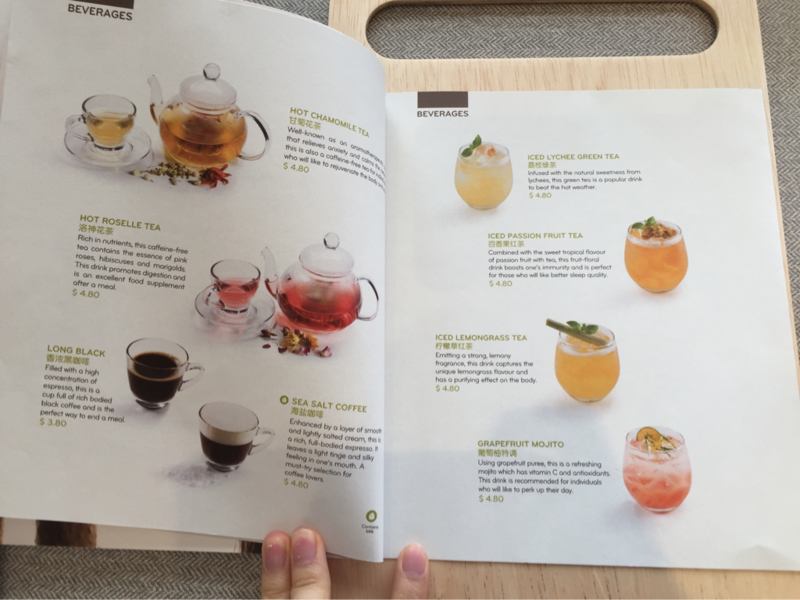 I am not much a fan of tea and this tea was way too sour for me. Hence, I gave let her have the whole pot to herself and she enjoyed it thoroughly. 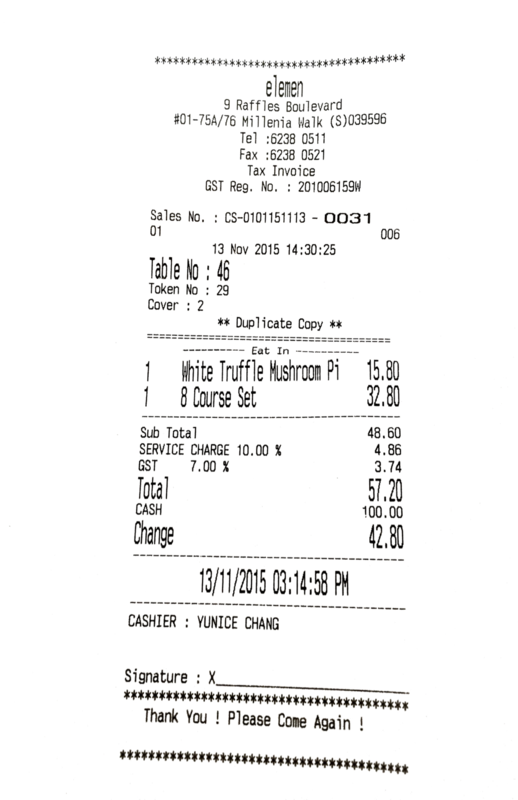 We both spent close to $30 each to share one 8-course set with an extra main. Even though it may sound pricey, there was a lot of food and we were completely stuffed after the meal. Hence, I think that the amount we paid was definitely worth it. 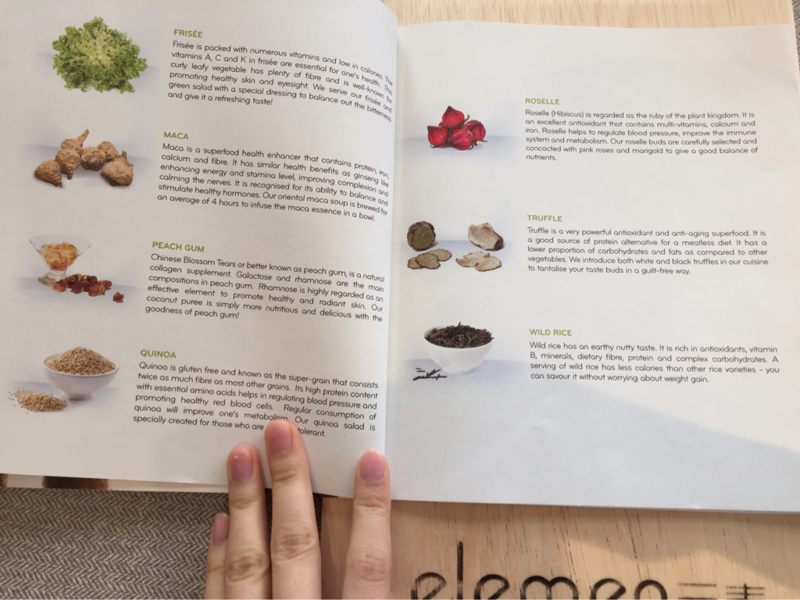 Elemen has definitely not failed my expectations with the vegetarian food we ordered. 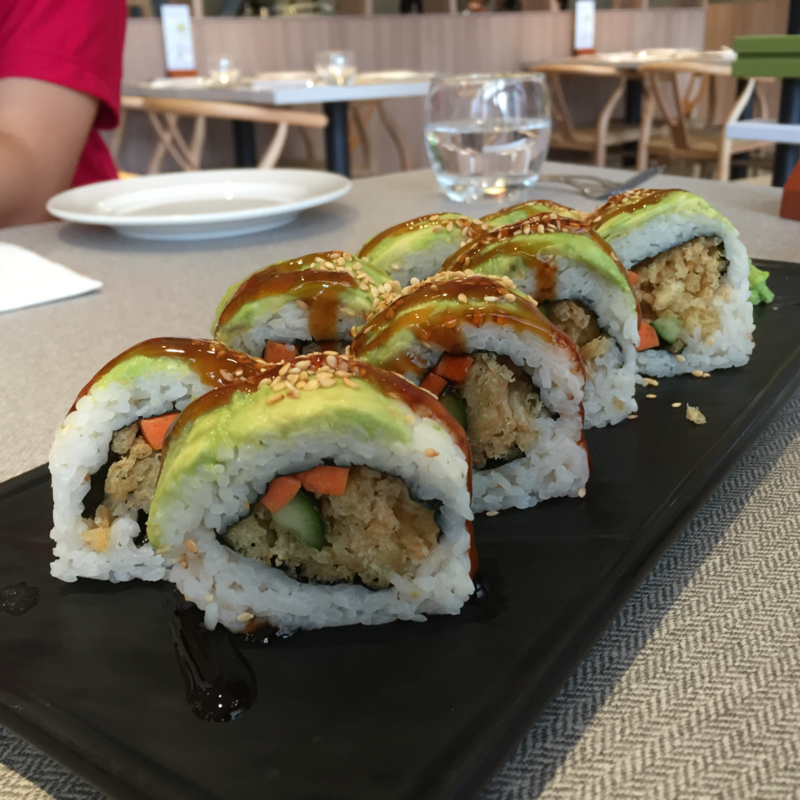 The food here is definitely some of the best I've tried in all of Singapore, not just under the category of vegetarian food. 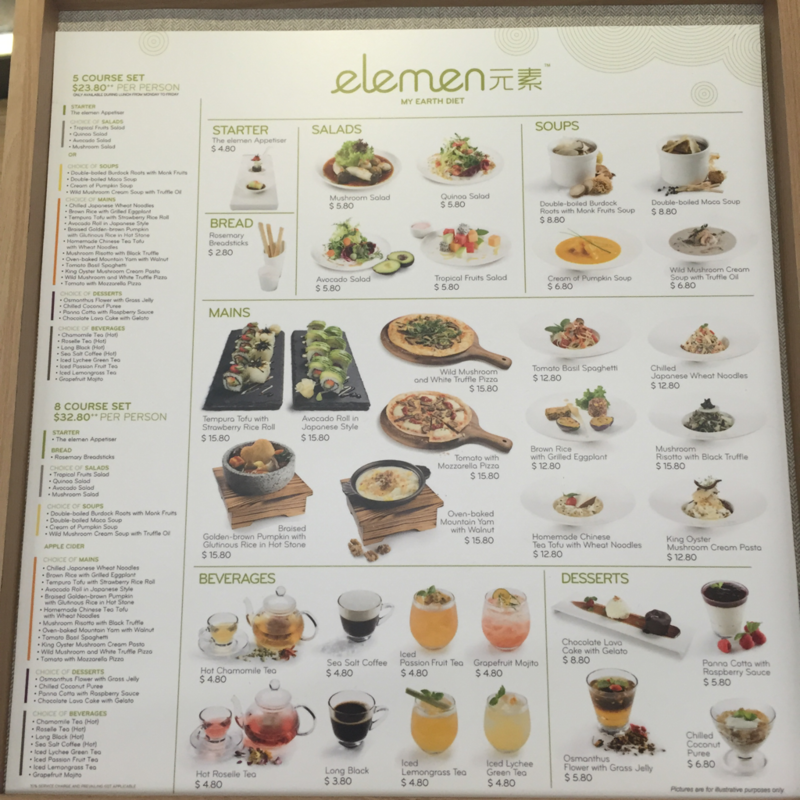 There are few places serving up vegetarian course meals in Singapore and elemen has definitely been doing it right. 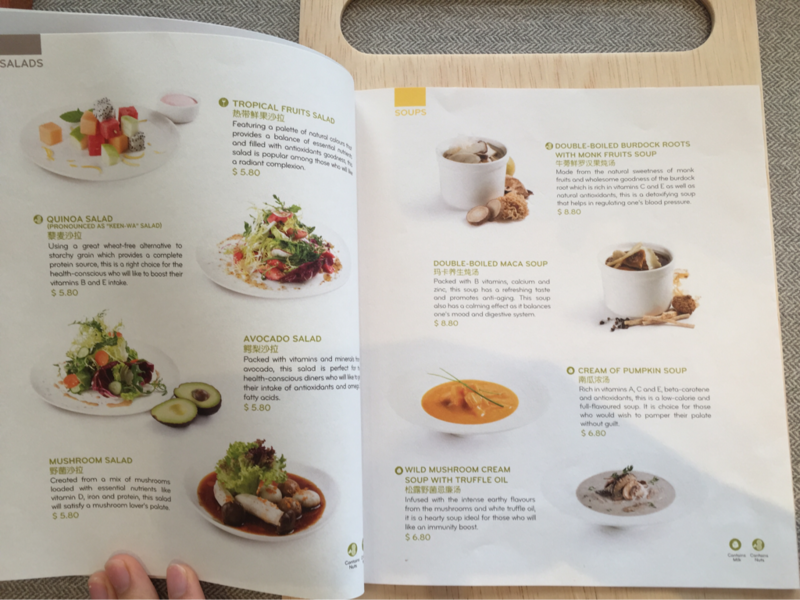 I highly recommend this place not just to vegetarians, but also to meat-eaters alike. 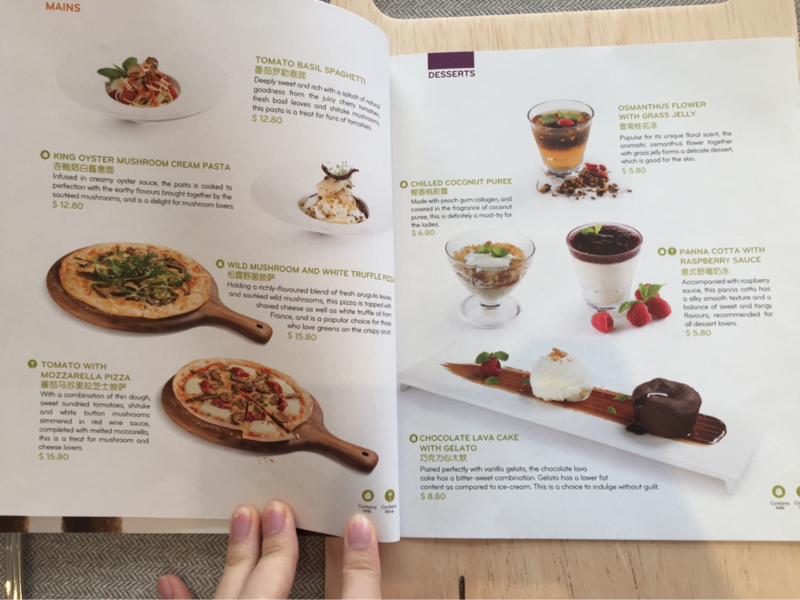 I specially recommend you to try the avocado sushi and truffle mushroom pizza when you're here, as well as the chocolate lava cake.